"The reality is, since 2010, no professional league or amateur association has made more of a change to help player safety than the NFL," says concussion expert Robert Cantu about the National Football League’s recent emphasis on safety on the football field. "I pledge that the NFL will do everything in its power to minimize the risks and maximize the rewards of this great and increasingly global game," promised NFL Commissioner Roger Goodell at a speech at Harvard University. The commitment of these insiders and outsiders to protect players from the vicious hits incurred in the game of American football is commendable, but we think that the sport of open water swimming has made more sweeping changes in its rules, protocols, and procedures than football. While the catalyst of these changes was the unfortunate tragic death of Fran Crippen, the changes have helped the sport of open water swimming prosper. From easy-to-implement changes like additional safety personnel on a race course to more profound improvements in the collective mindset and awareness of its administrators, the athletes and event organizers all benefit both in the short-term and long-term. Which is why it is baffling why no governing bodies or administrators around the world want to question the wisdom of FINA’s maximum water temperature rule that allows a race to continue for 30 minutes even when the water temperature is above 31°C (87.8°F). No one wants to question the decision by Cornel Marculescu and the FINA Bureau. Everyone seemingly has accepted the research results of the New Zealand researchers who came up with this conclusion based on studies done in a pool. On one side of the equation are the world’s administrators who all seemingly agree that swimming under intolerable temperatures that outlawed in the pool is safe. Their reasoning is based on FINA’s research that found swimming in water higher than 31°C (87.8°F) is not unsafe. Administrators around the world privately claim that they do not know the correct levels of maximum water temperature, so FINA’s decision becomes the de facto standard. They claim that if races at 28°C or 29°C or 30°C are outlawed, then many current races will have to be cancelled. They say that athletes can and must learn to acclimate to high water temperatures. On the other side of the border are most of the world’s competitive open water swimmers. While some swimmers can in fact to tolerate swimming competitively in pools and open bodies of water higher than 31°C, these swimmers are in a very small minority. One major flaw in this argument is that few competitors train in water above 28°C. Therefore, acclimatization is nearly impossible. Similarly on the other end of the spectrum, swimmers can get in trouble if they swim in 50°C without having the opportunity to acclimate in such cold temperatures. And even those who can tolerate swimming in such high temperatures admit that there is a specific negative impact on their performance. Caught in the middle of administrators on one side and swimmers on the other are event directors who are responsible for the overall safety of the participants in their races. Fortunately, from the shores of the Caribbean Sea and Australia to the heartland of America in Indiana, the concerns of the athletes remain the highest priority and the decisions of the FINA administrators do not even enter the equation. 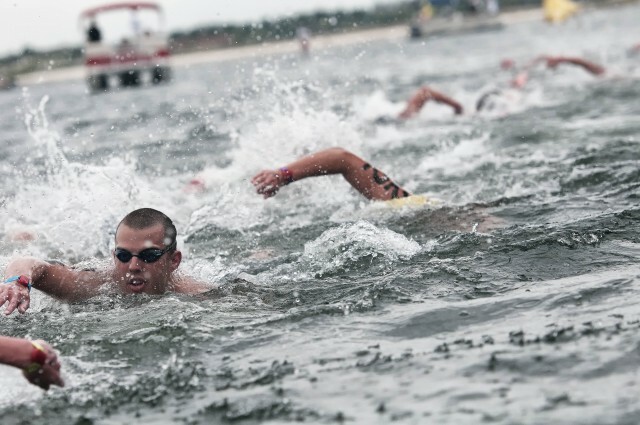 To the credit of event directors – the true guardians of the sport – when the water temperatures and conditions have been judged to be too warm, races have been either cancelled or race times have been adjusted to earlier or later in the day. Races have been shortened and race courses have been modified. Those decisions, while not always popular with all competitors, are commendable and correct. Such decisions are not only reasonable, but also respectful of the athletes’ concerns and very real physiological effects that all humans feel when swimming competitively in water warmer than 31°C. These decisions point to the reality of the situation – something that seems impossible for FINA to fully grasp. For a governing body that ignores the physiological and safety concerns of 100% of its athletes is disrespectful of the athletes. While FINA has done so much right recently in improving its safety net, there still remains a major flaw in its safety regulations: its maximum water temperature rule needs modification. Yes, FINA has done more than the NFL and every other sporting association, but the global governing body of aquatics still can modify its regulations for the better regarding maximum water temperature. If FINA does that - a very easy administrative decision - it will fall in line with the practical, prudent and reasonable decisions of the global community of event directors. SwimSwam talks about this issue with Alex Meyer, Mike Lewis and Steven Munatones here. Photo by Mike Lewis, Ola Vista Photography.